As part of a senior project at the University of Vermont, Abby Roleau pitched her plan for a diversified maple, pastured-meat and egg farm to a panel of loan officers. "Seven out of the eight laughed at me," she recalled. "They said it was not realistic: too much work for us and not enough money budgeted." But one loan officer listened. In 2014, thanks to that loan and the Vermont Land Trust, Abby's project went from paper to reality. She and her husband, Trent, purchased the 325-acre conserved agricultural property in Bristol that would become the Gateway Farm. 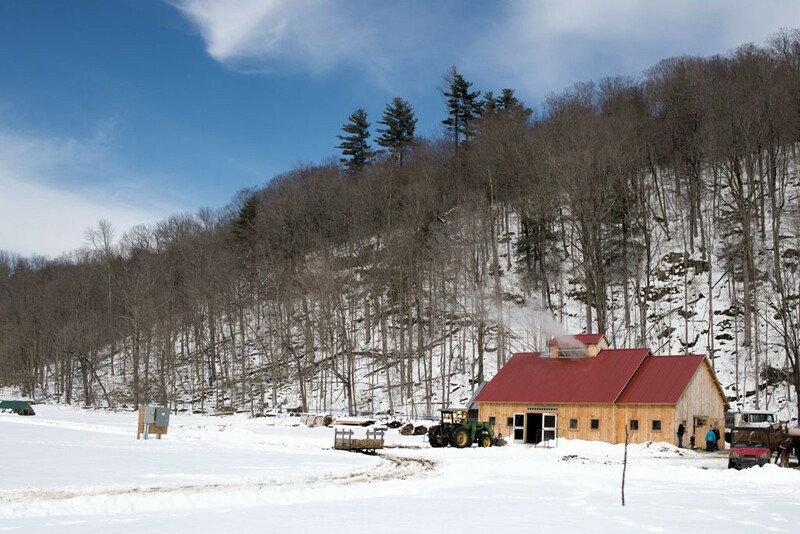 This is the second season the Roleaus have boiled sap in their own red-roofed, timber-framed sugarhouse, which Trent completed in late February 2018. The naysayers were right about one thing: The farm is a heavy load. "Startup in general is just challenging. You have all these great intentions, but everything costs money," said Abby, 27. "And you have to stand out. There are so many people trying to do the same thing." But along with the challenges have come pleasant surprises. Sometimes, the Roleaus have learned, you don't know which assets you have in your corner until you ask. Last year, a friend brought over a friend of his who was interested in doing a timber-frame project with Trent. The Roleaus spent about an hour showing the potential client their sugarhouse. "Later, we were telling another friend that some Ben Cohen guy had come over to look at Trent's timber framing," Abby recalled. "Our friend pulled up a photo and said, 'This guy?' And we said, 'Yeah.' And he said, 'That's Ben of Ben & Jerry's!'" 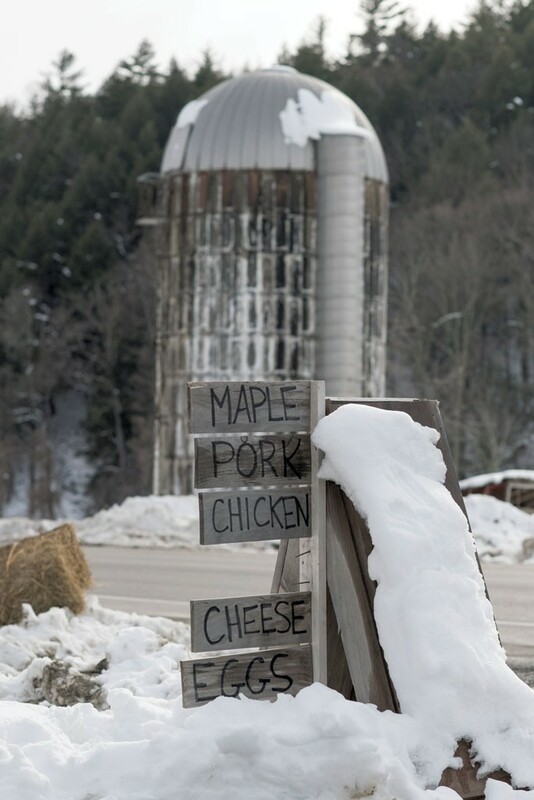 That explains how some of the 500 estimated visitors who came to the Gateway Farm's Maple Open House on March 23 and 24 not only got to taste Trent's favorite seasonal treat — vanilla ice cream drizzled with warm syrup — but had their bowls scooped by Vermont's iconic entrepreneurs. "We just asked Ben [Cohen] if he knew how we could buy Ben & Jerry's vanilla ice cream in bulk," Abby explained. "He said, 'I'll bring it, and I'll scoop ice cream.'" On Saturday, Cohen also brought along his old friend and company cofounder, Jerry Greenfield; on Sunday, he returned to scoop solo. "It was pretty cool," Abby said with a smile. But such brushes with fame aren't par for the course; the daily grind of farming can test even those filled with passion and energy. The Roleaus knew what they were getting into. Abby grew up on dairy farms in Weybridge and Shoreham; Trent's family owns a diversified farm and maple operation in Lincoln. The two met during high school before Trent went on to earn degrees in dairy farm management and diversified agriculture from Vermont Technical College. They married when Abby was in her third year of the Farms 2+2 Program: two years at VTC followed by two at UVM. After studying dairy farm management at VTC, she graduated with a UVM bachelor's degree in community development and applied economics with a minor in animal science. "We always both knew that we wanted our own farm," Abby said. "We just had to figure out how to make it work." "We went to school for it. We've done it our whole lives," Trent added, standing deep in one of their sugarhouse's stainless-steel tanks and washing the sides to prepare for the next batch of sap. They took the first major step toward their dream during Abby's senior year at UVM, when she had to develop that business plan. The couple had seen the Vermont Land Trust's call for an agricultural buyer for a former dairy farm in the Bristol Flats area that had 45 tillable acres and a sugarbush. "Animals are my passion, and Trent loves maple," Abby said, noting that the seasonal workload of sugaring followed by grazing also made sense. The location near family members was another big plus. "My project was as real as it could get," Abby said. She spent months fleshing out her business plan with her mentor and adviser, the late professor Bob Parsons, then presented it to the panel of loan officers. They weren't impressed — except for one panelist who knew the couple and their families. He asked questions and said he could see the plan working as long as the Roleaus really buckled down. Six months later, he wrote them their first loan. The couple's first priority was to build themselves a house, which they finished on time and under budget using lumber from their own woods, the help of family and friends, and plenty of sweat equity. They started cultivating a variety of grass-fed livestock, opened a small farm stand, set 8,500 maple taps and geared up for on-site sugaring. Abby worked for Yankee Farm Credit until shortly after the couple welcomed their third child, toward the end of 2017. Trent still does carpentry and timber-frame construction jobs in addition to his farm responsibilities. One factor that drew the Roleaus to their farm was its high-visibility location on Route 116. "It was a huge selling point," Trent said. "We love people coming in and seeing the process [of farming]. We want to show the public every bit of it that we can." When the Roleaus bought the farm, their eldest, Sophia, was a babe in arms, and her two younger brothers not yet born. Today, with three active youngsters running around, the couple keeps a close eye on the big road. The two older children were busy digging into a jar of maple butter when Abby sat down in the sugarhouse to chat last week. Looking around for her youngest, she called to her husband to make sure 1-and-a-half-year-old Bradley was in sight. "We take turns doing kid check," she said. The kids contribute to both the juggle and the joy of farm life. The couple hopes their offspring love growing up on a farm as much as they did. "We do this for them, too," Abby said. Nurturing a new farm and three young lives simultaneously can be a lot, but "You go all-in on both. You don't really have a choice," she said with a laugh. Personal and professional tend to merge on a farm. On the Roleaus' list of future projects is a commercial kitchen in the sugarhouse, but for now the family kitchen does double duty. On March 26, the table had been taken over by a maple-candy machine, and several counters were crowded with piles of fresh eggs. Through their driveway farm stand, the Roleaus easily move all the eggs produced by their flock of 80 layers; they plan to add 20 to 30 more this year. Their beef, pork, lamb, chicken and seasonal turkeys pack two chest freezers. Maple syrup and candy are stacked on shelves. During the summer, the family also sells their own sweet corn; strawberries they pick in Orwell; excess tomatoes, cucumbers and winter squash from their vegetable garden; and peaches from a farm across the lake in New York. Selling direct "is the best way to make the most money on everything," said Abby. But it takes time. As they grow, the Roleaus expect to do more wholesale; they're already trying it with their syrup business. 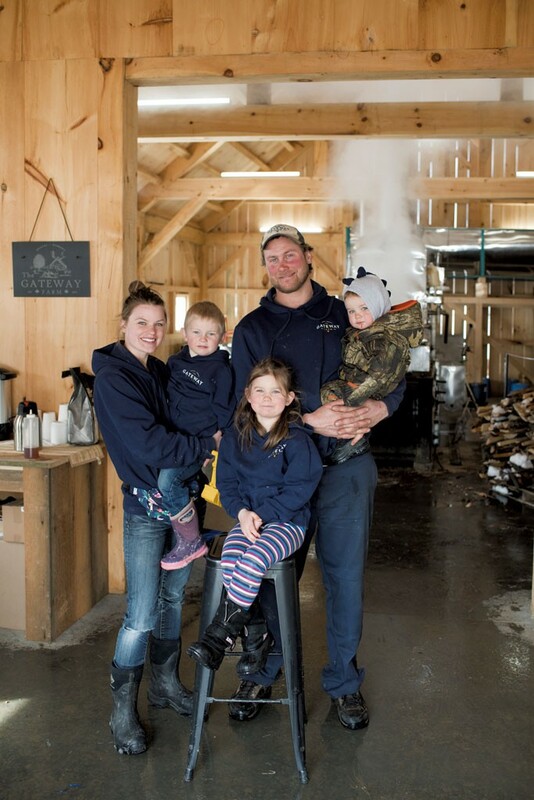 Having heard that Champlain Orchards in Shoreham was buying maple for its hard ciders through a large packer, Abby got in touch via email to propose the Gateway Farm as a local, family-run alternative. They got the contract. With syrup especially, Abby said, it's hard for a producer to set itself apart. The couple is working on value-added products such as bourbon barrel-aged syrup, candy and their maple butter, a unique caramelized blend of butter and syrup. With a close eye on the local market, Abby is building a solid following on social media, especially Instagram. As we talked, Florence Kirby, a farm neighbor, stopped by looking for dark syrup to use in pancakes, baked beans and her family's favorite maple muffins, made with biscuit dough dropped into a panful of syrup, cream and butter. Kirby has lived "60-some-odd years" a couple of miles down the road. "I'd rather buy my syrup locally," she said. "It's great to see the farm busy again. I loved watching the pigs last fall." The Roleaus remain open to trying new things. This year, they'll plant hemp for a committed buyer. Last year, inspired by a couple of friends, they experimented with tapping birch trees and boiling the sap into syrup. Birch requires the same evaporator equipment as maple, although it takes longer to produce because of a higher sap-to-syrup ratio. It extends the total sugaring season for the Gateway Farm, because birch sap starts flowing later in the spring than maple, when the temperature remains steady at about 50 degrees day and night. The resulting syrup is more savory than maple, with a lightly bitter, mineral tang and a gentle hint of molasses. Abby likes to use it in marinades with avocado oil, balsamic vinegar, Dijon mustard, garlic and rosemary. 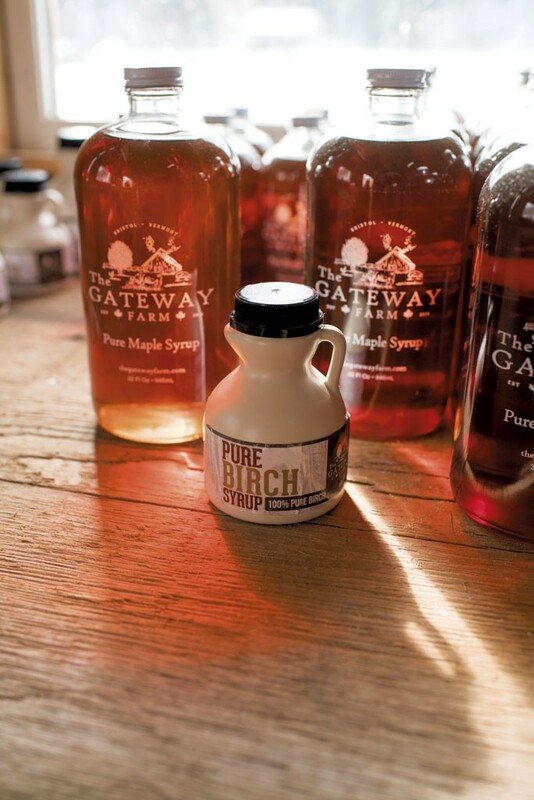 So far, the less familiar syrup has sold mostly through a specialty distributor. Like Vermont's spring weather, the ups and downs of a farm startup can be unpredictable. "Some days it feels like we're getting nowhere," admitted Abby as she watched her kids splash happily in mud puddles, "but we have our family and such a great community of people watching our progress; that's what we use as motivation." "We're working our own land, doing as much as we can ourselves," her husband added. "We couldn't ask for anything more." The original print version of this article was headlined "Sweet Start | Young Bristol farmers invest muscle and heart in their diversified operation"